Guest post by Elinor Mills of Bateman Group. This is a guest post by Elinor Mills, vice president of content and media strategy at Bateman Group. Who said journalism is dying? Judging by recent news, it’s just shifting. Vox Media acquired Re/code, creating a news powerhouse that includes The Verge. Meanwhile, newly shuttered GigaOm relaunched with plans for a Structure conference for October, and Buzzfeed’s Mat Honan is quietly amassing an army of (well, two dozen) journalists to add news into the clickbait mix. With the emergence of sites like The Information, Quartz and Medium, we’re seeing a renewed focus on original reporting and longform journalism after a low period where the lowest common denominator of the blogosphere seemed to be exerting undue influence on media trends. Journalism has changed profoundly over the past few decades. I was talking to a colleague recently after hearing Vint Cerf speak about the early days of the Internet, which I covered as a reporter in the early 1990s. I found myself falling back on the tired cliche of “back in the day,” as I do when talking about technology, journalism, Burning Man, San Francisco, my figure. Cerf helped create the Internet as a tool for academics. It’s since become the lifeblood for much of our daily lives, revolutionizing our communications and journalism in the process. Mobile, the cloud and social media have further enhanced reporting. And it all happened in what to me seems like the blink of an eye. One minute, I was using an electric typewriter for college assignments and punch cards in computer science class. The next, I’m live Tweeting news from my smartphone, taking videos on my iPad and Skyping with sources across the globe as a professional journalist. I’m a tech “tweener” straddling the days of print newspapers and the modern mobile era. It’s an amazing time for anyone to be alive (particularly if you’re privileged enough to live in Ground Zero of the tech revolution, like I do). I had a front row seat as a tech journalist during the giddy ‘90s when we first realized we’d reached an inflection point and the Information Age was born. But we didn’t have all the information at our fingertips, like journalists do now. What would Gen X-ers do without Google Search? They’d have to look up facts in an encyclopedia. When I got my first paid reporting job at The Associated Press in 1990, the news bureau’s most important source was the local public library reference desk. We didn’t have mobile phones to make calls, let alone take photos or map directions. When time was of the essence on breaking news, we’d cover it in teams of two. One person would take notes in the courtroom and another would just be planted at the closest payphone, basically squatting so we could call in and dictate a story to editors when a verdict was reached. “Collaboration” meant looking over each other’s shoulders as one person typed a story, not writing a story simultaneously in the same document. Information sources are more abundant and easier to find than ever before. A reporter can easily reach people via email, website, Twitter, Facebook or LinkedIn. Social media offers a way to access public opinion polls and speak with people the reporter doesn’t know. It widens the circle of both sources and audience. Journalists today don’t get out and pound the pavement like they used to do; they just have to log on. Information tells the story, and data doesn’t lie. It makes it easy to sniff out and cover trends rather than rely on anecdotal evidence and speculation. Open data, the sharing of formerly hidden or hard-to-find government information, and data analytics are critical to good investigative journalism these days. 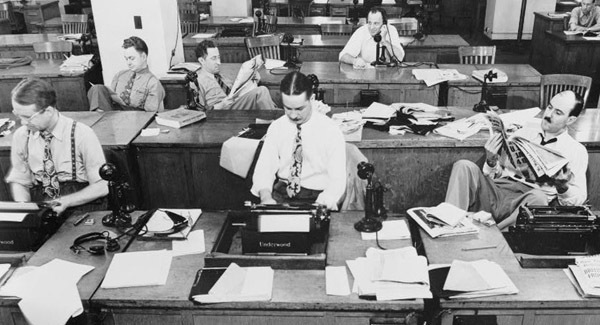 Before, it was easier for documents to be “lost” or bureaucracy to stymie even the most dogged reporter.